As much wonder and beauty traveling adds to your life, being away from your home base presents a laundry list of interruptions. While some are welcome — hello, poolside drinks! — others may leave you feeling lackluster and lethargic. That’s why many frequent fliers try to maintain some sort of fitness routine to keep their sanity and fill them with the energy to plug through their responsibilities, both in work and in pleasure. Since your gym equipment can be heavy (likely more than the weight allowance for your checked bag), you need to get a little creative with your workouts. The good news is your hotel room is a great place to work up a sweat if your lodging doesn’t offer another alternative. There are also very few items — if any — you need to pack to do strength and cardio training while on the go considering the only thing you actually need is the will to work out. Here, the no-brainer guide to staying fit in your hotel room. While sure, your beloved high-intensity interval-class instructor might dazzle you with complicated moves and combinations, if you’re leading yourself through a 40-minute sweat sesh, consider going back to the basics. After all, those tried-and-true old-school exercises have been around forever for a reason: They’re simple and they’re effective. Yoga instructor and personal trainer at the Carillon Miami Wellness Resort Ivana Levin says using jumping jacks, squats, sit-ups and push-ups to warm up followed by a few strength-training moves is enough to benefit your heart and body. 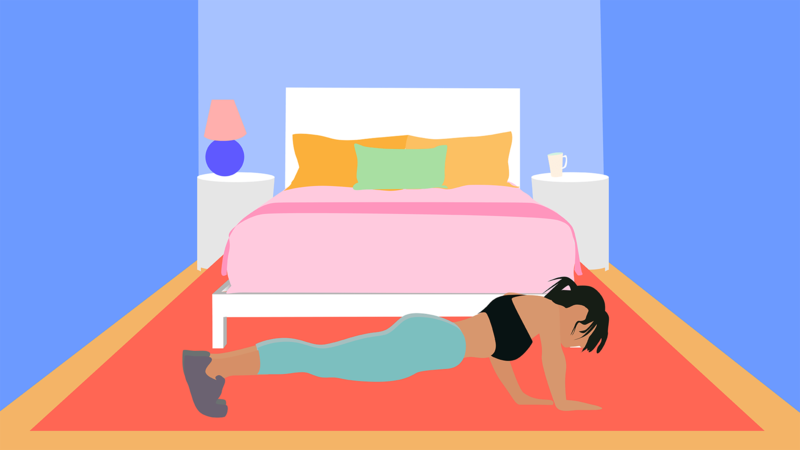 She suggests combining a plank on your elbows or hands, plank variations (like those difficult army crawls), squat presses with a large jug of water and some burpees is totally doable in the comfort of your hotel room. Traveling light is trendy these days thanks to the ever-growing backpacking and digital nomad community, but if you carry on anything fitness-related, let it be resistance bands. As Shannon Stringert, the director of spa, salon and fitness at The Cosmopolitan of Las Vegas, explains, these lightweight wonders can work every muscle group without taking up any space in your suitcase. “The versatility of the band allows you to train all major muscle groups. Use a phone timer to do interval training, choosing between four to five exercises, 45-seconds on and 15-seconds to recover. You can make your work and recovery time longer or shorter depending on your fitness level,” she suggests. Especially if you’re traveling for work and bouncing between client meetings and happy-hour schmoozing, you need a workout you can complete without much thought. Harrison says to adopt the 100-circuit mind-set, which requires zero equipment or planning. How does it work? After running to warm up, do 100 push-ups, 100 sit-ups or crunches, 100 bicycles and 100 squats. She says you can either do it all at once or break them into 10 sets of 10 to make it more manageable. Don’t like running? Instead, Harrison recommends adding some cardio in between your segments, like high-knees, squat jumps, jumping jacks or mountain climbers. Who wants to hang out for hours in their hotel rooms when there is a beautiful city, countryside or beach to explore? Setting realistic expectations for your on-the-go fitness routine will ensure you don’t miss out on the experience of traveling because you’re worried about working out. That’s why fitness instructor Debbie Cornelia at The Ritz-Carlton Reynolds says to supercharge your creativity and be flexible with your workout. One simple way to do this is by adding your 30-minute or one-hour fitness block to your calendar, much like you would schedule an excursion or dinner. Who says you have to use the floor to work out? Or even a mat? Much like the customs and cultures transform as you cross time zones, there are no set rules for working out in a hotel room. As Monica Picard, a fitness instructor at Rancho La Puerta, explains, you can use basically any surface to build that resting heart rate. Sure, it’s great when your hotel has a fully equipped gym and pool, but because that’s not always a reality, these tips can come in handy the next time you need to fit in a sneaky workout while on the road.